12-Volt 125Ah AGM Deep Cycle High Performance Battery. RC (min): 260 Energy (KWH): 1700kWH Terminals: 8mm (included) Dimensions (inches): 12.9"L x 6.8"W x 8.7H Weight: 75lb Charging Current: 7A-35A. (a smart charger is recommended) Charging Voltage: 14.4V-14.9V Float Voltage: 13.5V-13.8V. No Dangerous Fumes or Gases. Custom Built Military Grade Alloys. Extremely Low Self Discharge Rate. Approved for Mobile, Maritime and Air Travel. Extreme Vibrations, Heat and Weather resistant. Sealed, Non-Spillable, Non Hazardous Construction. Maximum Power Density and Deep Cycle Capabilities. Smart / Microprocessor controlled charger: Battery Charger Guide. Standby use: -20mV/C per Cell. BCI Group Code: 31 (+) on L. The unique construction and sealing techniques of VMAX tanks guarantee leak proof operation in any position with no adverse effect to capacity or service life. VMAX tanks are classified as non-spill able, non-hazardous, dry batteries making them NOT restricted for Surface, Maritime and Air Transport. VMAX tanks utilize an electrolyte suspension system consisting AGM (Absorbed Glass Matt) of a high porosity that totally absorb and contain the electrolyte. No silica gels or any other contaminants are used. There is no need to check specific gravity of the electrolyte or add water to. The extra strong ABS container reduces case bulging and plate warping, ensuring long life and high performance. Low Pressure Valve Regulated System. Are equipped with safety release valves, designed to operate between 0.98-196.1kpa and automatically reseal. Hence, there is never an excessive accumulation of gas within the battery. Heavy Duty Military Grade Grids. Heavy duty lead tin alloy grids provide an extra margin of performance and service life in either float or cyclic applications, even after repeated over discharges. VMAX is known to deliver one of the highest numbers of discharge / recharge cycles. Depending on the use and average depth of discharge it can offer an average of. Have an expected life span of 8 to 10 years in float service applications. The self discharge rate of the new VMAX tanks at room temperature is approximately 1-2% of rated capacity per month (compared to 2-3% for most other AGM batteries and 15-20% for Lead Acid batteries). May be operated over a broad range of ambient temperatures. Ultra Low Resistance make it up to 99% efficient (compared to 85-95% as in Lead Acid Batteries and 97% in most other GEL and AGM batteries). A special assembly technology is used to enhance power density to a considerable level. 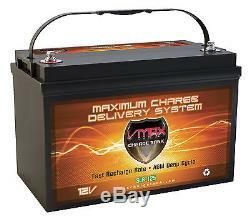 Dont settle for an average Lead Acid Battery, upgrade to a VMAX CHARGE TANK. Premium AGM deep cycle battery! The item "VMAX SLR125 Group 31 Solar Sealed Battery AGM Deep Cycle 1.7kWh 12 Volt 125Ah" is in sale since Saturday, March 17, 2018. This item is in the category "Consumer Electronics\Multipurpose Batteries & Power\Rechargeable Batteries". The seller is "bargainshore" and is located in Detroit, Michigan. This item can be shipped to United States, Canada.